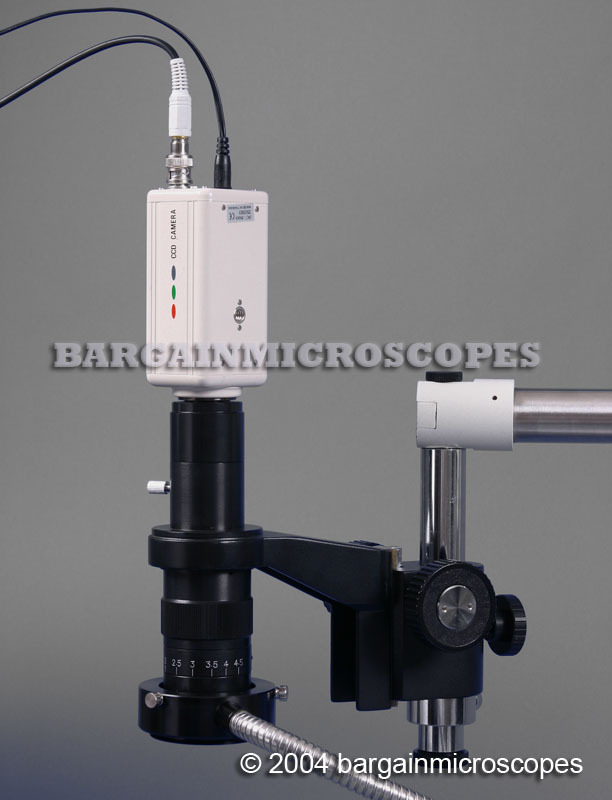 Boom Stand Mounted Video Zoom Inspection Microscope! Great for Inspection, Quality Control, Assembly Lines, Repair of Small Items, or for Circuit Board Repair and Rework! Are Your Employees Tired of Staring into Binoculars all Day? Get them a Video Setup with a Monitor for Ease of Viewing and Less Eye/Neck/Back Strain! Full Unit sells for $3000 in Several Industrial Equipment Catalogs! Video camera included for live motion video on cctv monitor or television. Display monitor not included. Camera, cmount adapter for camera, and power supply included. High intensity illumination with complete ring fiber optic light system. 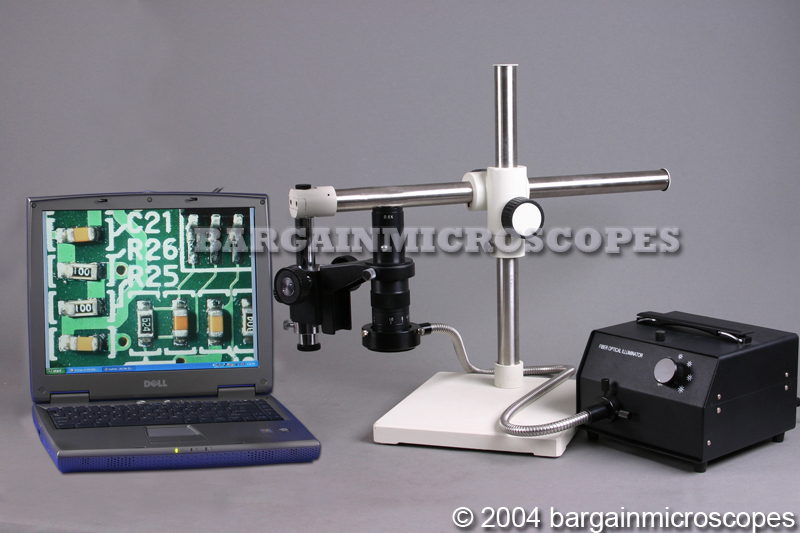 This 150W variable intensity microscope illumination system enhances overall viewing of specimens. 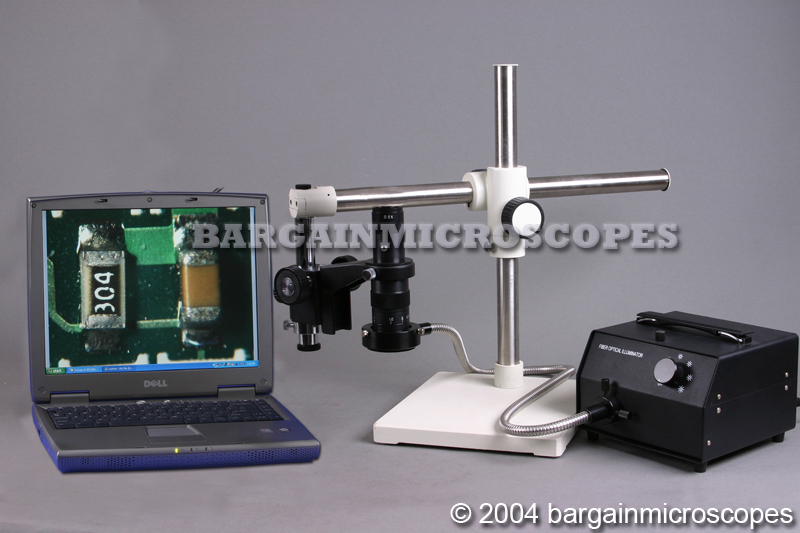 It is a great benefit for use with video microscopy and digital microscope photography. Continuous zoom optics with objectives 0.7x – 4.5x. 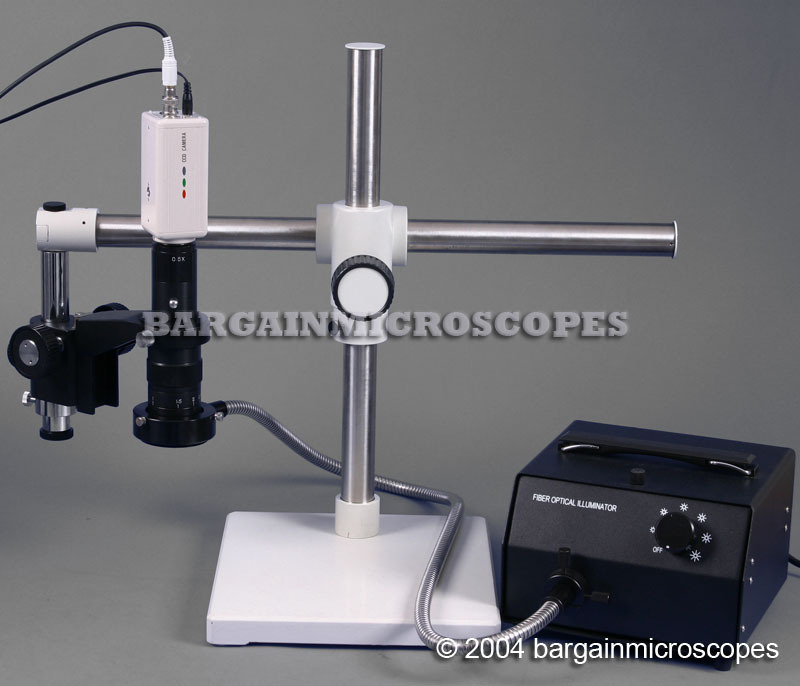 This gives a visual 7x – 45x magnification. Actual magnification depends on zoom setting, camera’s chip size, and monitor size. As the zoom magnification is changed, the focusing knob needs to be adjusted. Long Working Distance Design to Allow Room for Your Tools (Distance from Bottom of Lens on Head to Top of Object in Focus). Distance Varies Depending on Zoom Magnification. 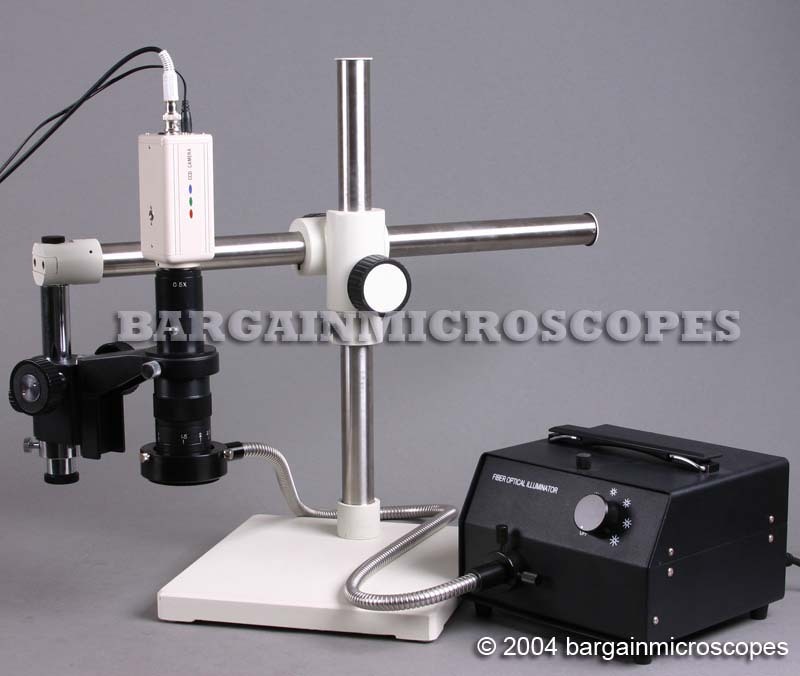 Includes 0.5x C-Mount (CCD Camera Attachment) with reduction lens. Includes Instruction Manual, Lens Cleaning Tissue, and Dust Cover. Optional Bottom Lens to Increase or Decrease Magnification or Change Working Distance. 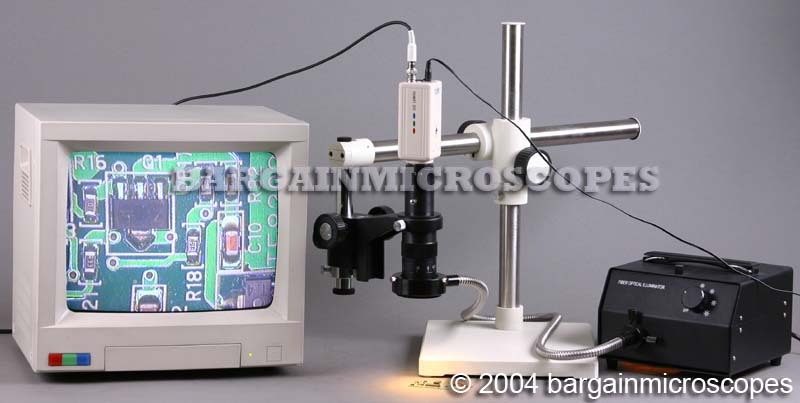 Optional C-Mounts with Lens to Increase or Decrease Magnification. Optional 150 Watt Fiber Optic Ring Illumination System.